They do the basics pretty well. Long line, but moved ok. I went with Wiz and fried onions. Soft but, felt like a little more cheese and onions would have been nice. 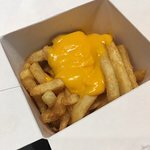 Cheese fries were simple and delicious. I’d go back next time in the area. Shared a cheese steak sandwich and wished I had a whole one! Great meat flavor, nice soft roll. Took one to go and daughter ate it 2 hours later and declared it just fine. Definitely one of the best I have eaten! Very Long line, but worth the wait. The basic cheesesteak with wiz, fired onions . It was good, they all are, the staff hustles and is very nice. Always a favourite destination when I'm in Philly!! 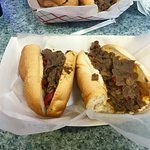 As usual Carmens Cheesesteaks never fail to live up to expectations. 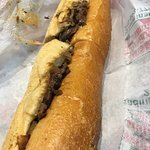 I was a trade show across from Reading terminal and told my team ( Many who had never been to Philly before or know what a Cheesesteak was) that i was going to Carmen's to get a cheesesteak. 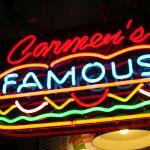 I tried to tell them what is was and how Carmens is an icon for foodies in Philly. 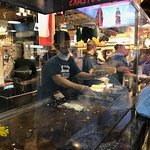 So there i went a waited for only 30 minutes ( got lucky) watched them make a few cheesesteaks, and had tome to reminisce about all the of the Cheesesteaks I ate when I lived in the area in the mid-2000's. 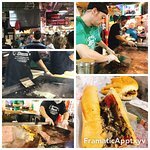 I finally got to to order my cheesesteak with peppers and mushrooms watched them make it and brought it back to the Trade show where we were setting up. When my team saw what it was and smelled that delicious cheesesteak they all took off and waiting almost an hour to get theirs. 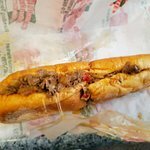 For most of my team it was their first authentic Philly Cheesesteak. Everyone on my team loved it, some even went back a couple of times during the show. 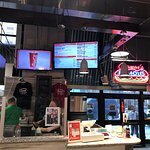 The experience and the food have not changes since my last visit. Always great and always fresh!! If you're in Philly, this is a Must!!! 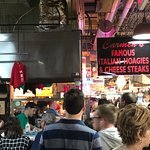 I love coming to Carmen's for my cheese steak fix when in Philly. I make a B line to the Reading Market every time I am in town to have my cheese steak without with Wiz on one of their soft rolls. Their sandwiches are really large so you have to come with an appetite. You get a large portion of thinly sliced steak with a big glob of Cheese Wiz on it on a soft roll makes a nice combination and is heaven in every bite. 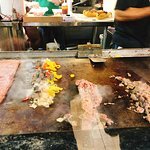 Everyone is freshly cooked to order and is sizzling hot when you bite into it. I love the taste of the Wiz on the cheese steak. It is the best! 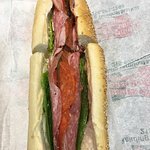 Been to Carmen's Famous Italian Hoagies & Cheesesteaks? Share your experiences!